This complete system is not only built for daily driving, but will handle about any off road excursion you can think of. The heavy duty main crossmembers are locked together by a full belly pan that offers superior off road protection. The CNC machined steering knuckles ensure a clean and simple install. Requires frame bracket modification and welding. Stock 18" wheels can not be installed. Factory 20" wheels with more than 6.25" backspacing can not be installed. 2WD models may require rear driveline modification. 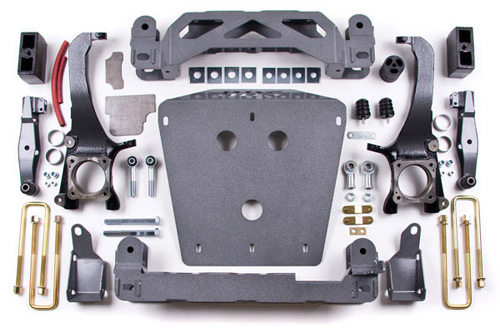 When kit is installed on 2WD models the differential brackets will not be used.